What a time to be alive guys and gals! There are so many meal kit subscription boxes to choose from it makes my head spin. Today I am breaking down my top 3 of all of the kits I have tried and I will share with you the top steals and deals that are currently happening. As many of you may already know, cooking is something that I am truly and deeply passionate about. These meal kits are always a pleasure to prepare and we all join the Clean Plate Club every single time. My top three favorites will be discussed in this post. Continue reading to find out more about Sun Basket, HelloFresh, and Marley Spoon. These meal kit subscription boxes also make great gifts for your loved ones. The holidays are quickly approaching and when you give the gift of food it is always a memorable gift to receive. There are a variety of benefits and perks to trying out these meal kit subscription boxes. First of all, these meal kits are super convenient! It doesn’t get any better than this folks… fresh food delivered straight to your door. You can skip the grocery store. You choose the day that you would like to receive your meal kit and it will show up at your doorstep! My favorite part about receiving these meal kits is that they inspire me to eat with an open mind. Many of the recipes that you can choose from are not only delicious but unique. They give you gourmet flavor in the convenience of your home and you get to be the chef! Your family will be amazed by the dinner that you whip up for them. Here is another great thing about these food subscription boxes. I have tried many meal kits and found all of the recipes simple and easy to follow. You can read more about Sun Basket in my review on the blog. 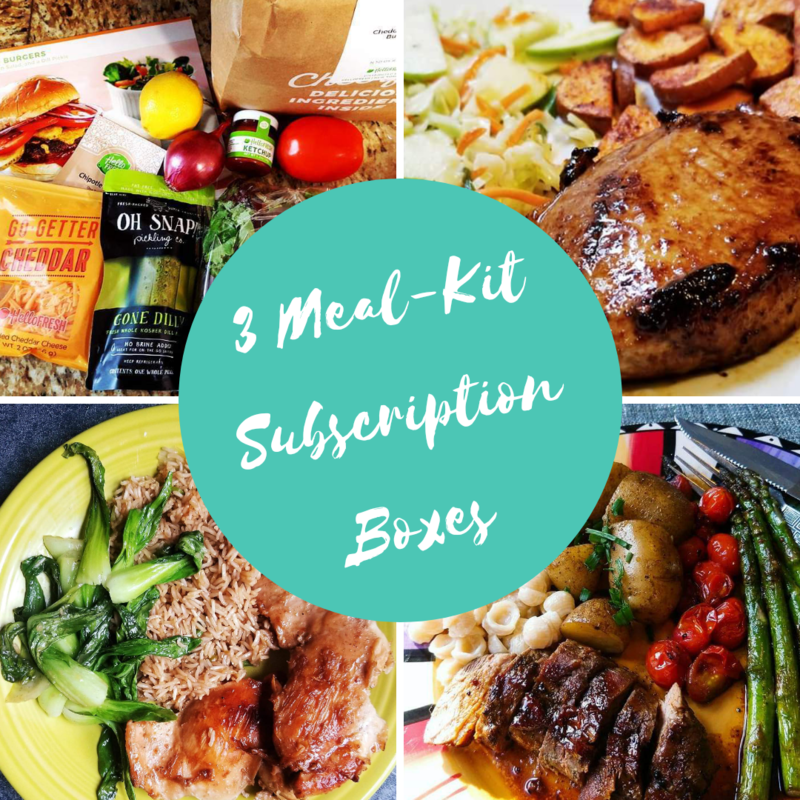 I recently tried Sun Basket’s meal kit subscription box and I was very impressed with the recipes and the quality of the ingredients that were provided. When I gave Sun Basket a whirl I went with the gluten-free paleo meal kit. Sun Basket is a subscription service that relies heavily on clean eating. They only send out high-quality organic ingredients for your meals. You can have a bit of peace-of-mind when you enjoy your Sun Basket meal because their ingredients are only sourced from the best. They will provide premium meat and seafood (antibiotic and hormone-free) and only the freshest organic produce. They have a few different plans to choose from to suit your diet. Sun Basket has the following meal plans available: Mediterranean, paleo (gluten-free), and a vegetarian option. Sun Basket currently has an offer where you can receive $80 off your first four orders. With this offer, you will receive $20 off your first four boxes of the Sun Basket meal kit subscription box. If you want to try out Sun Basket for a 2 week trial period you can save $45 off your first two boxes of food. This is split into two tiers of savings. The first box is $35 off and the second meal kit will be $10 off. Check out the photos below of the meals that I created with my Sun Basket meal kit subscription box. HelloFresh was actually the first meal kit subscription box that I have ever tried. They are the brand that made me fall head over heels in love with meal kits. The meal kits from HelloFresh are always a joy to cook and they are a sure people pleaser at the dinner table. HelloFresh ships out only the freshest and finest ingredients for your recipes. I have found that they are one of the easiest meal kits to prepare at home. HelloFresh offers three plans: Classic, Family, and Veggie. You can view the menus on their website and customize your meal kit. I have a fully detailed review of HelloFresh on my blog if you would like more details on this subscription service. HelloFresh has a fabulous deal taking place right now where you can receive a total of $60 off your first meal kits. With this deal you get a $20 discount on each of the three boxes. Marley Spoon is meal kit subscription box brought to you by Martha Stewart. Martha Stewart?!?! Ok then you know this is going to blow your mind. When I think Martha Stewart the first thing that comes to mind is perfection followed by gourmet food. There are ten different options to choose from on the weekly menu with Marley Spoon. If you are following a vegetarian diet, you are in luck because there are vegetarian options available. You can read my full review of Marley Spoon on my blog. Check out the images below to see a couple of different dinners that I prepared with the Marley Spoon subscription box. I really truly do love these meal kit subscription boxes and I think I’m ready to give another one a whirl very soon. There are so many different ones out there to choose from nowadays. My favorite thing about them is the simple and easy to follow recipes that result in a meal that is bursting with gourmet flavor. Many of these meals, to me, are restaurant quality meals. So what are you waiting for? Get cooking with one of these meal kits and bring the taste of gourmet to your dinner table. Your family will be amazed by the meals that you serve during the week. These deals that are currently happening are too great to pass up. These deals give you a fantastic opportunity to give these boxes a whirl. Have you ever tried a meal kit subscription box? Tell me about your favorite in the comments below. This entry was posted in My Cooking Journey, Shopping Guide, Ways To Save Money Grocery Shopping and tagged clean eating, cooking, coupon, food, gluten free, healthy, healthy eating, healthy food, HelloFresh, Marley Spoon, meal kit, shopping, subscription box, Sun Basket, vegetarian. Bookmark the permalink. I am a horrible cook but my husband is amazing. Because he is so good, he has to do all the cooking. This subscription box would give me the ability to make some amazing meals and take some of the stress off him. I have tried HelloFresh in the past and their food is very good. I love the meal selections you got. Looks delicious! This food all looks so good. I especially like the Smash Burger! I have not tried a meal subscription kit but this looks delicious! Pingback: Healthy Food / Groceries Coupon Codes, Promo Codes, Discounts - Save Money!